Whilst I’m not one to shy away from the traditional camping set up, for this occasion I was looking for a unique, yet luxurious experience that would be fitting for one of my beautiful best friends, whom I was surprising with a weekend away to escape (temporarily) the day to day life of being a (magnificent) wife, mother, daughter, friend, employee, entrepreneur and all of the other roles we play in our day to day lives of being an adult (ugggh). ……And to truly surprise someone who is generally the ultimate control freak (in a good way), I wanted it to be something that she wouldn’t suspect. 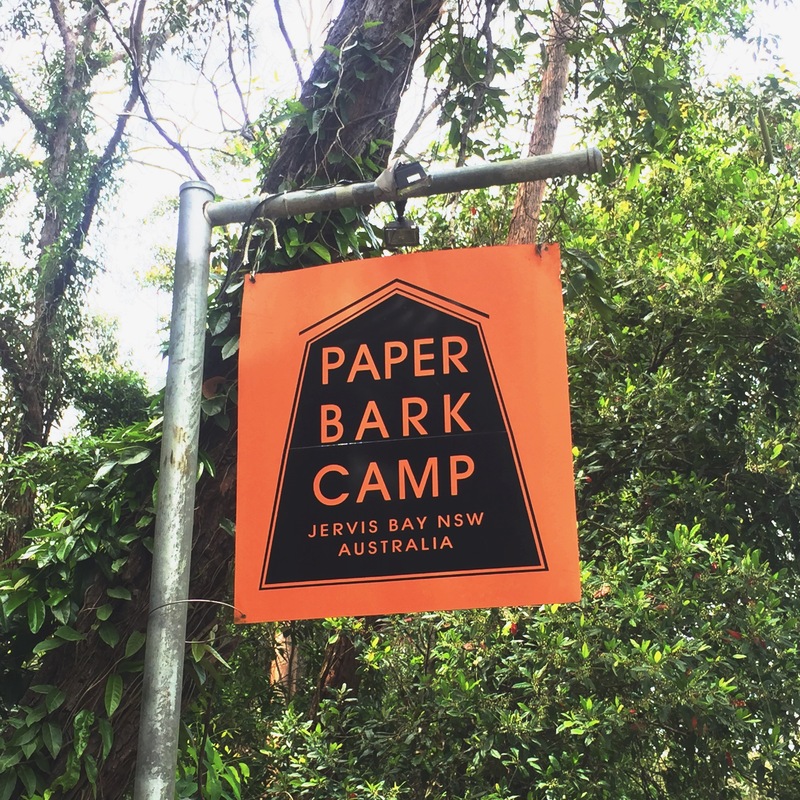 Introducing Paperbark Camp, in Jervis Bay on the stunning South Coast of NSW. 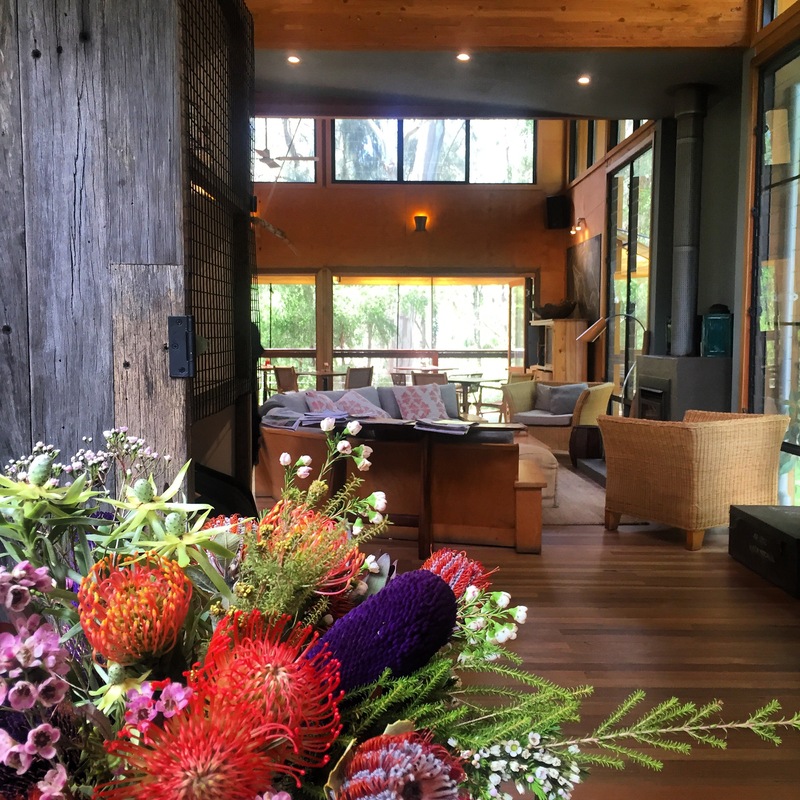 The ultimate luxury and eco friendly bush retreat, where you are immersed in Australia’s unparalleled flora and fauna, and is the perfect hideaway to do as much or as little as you like. From the moment we padded lightly up the stairs (so as not to disturb the serenity of this quiet and mesmerising location), and into ‘The Gunyah’ (which is Aboriginal for meeting place, or place of shelter) we were immediately at one with our bush surroundings. 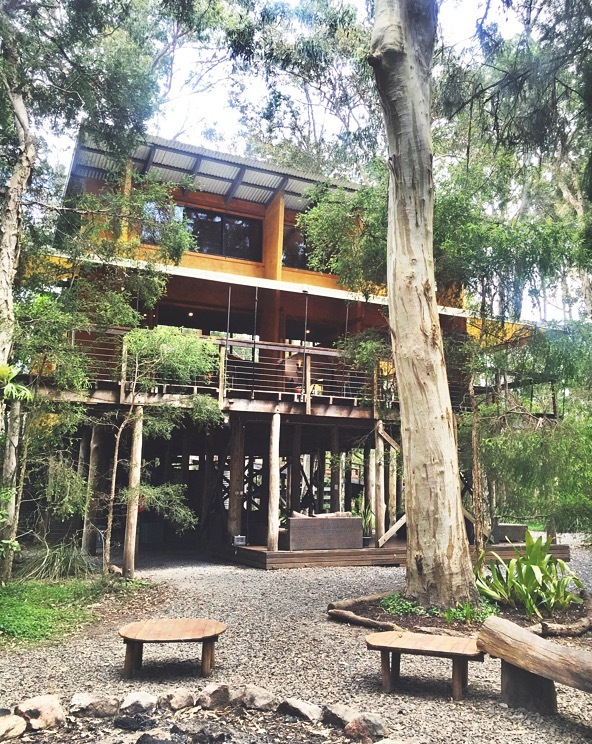 Perched high on stilts, among the Eucalyptus trees, The Gunyah is where we were greeted with a very warm welcome, checked in and swiftly orientated with the main building and guided to our ‘tent’. 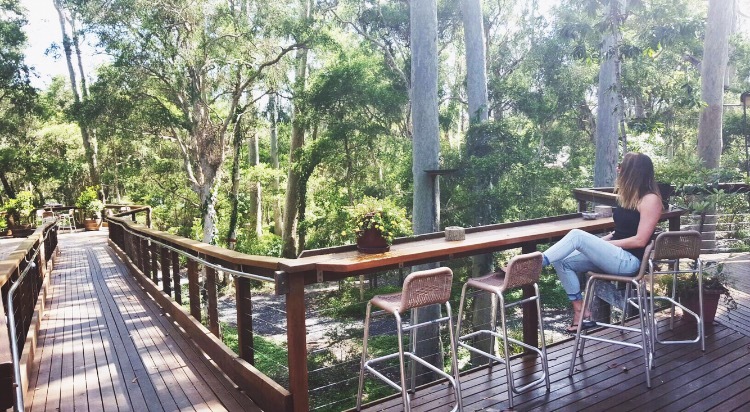 The wood platform also allowed space for a generous balcony area, where there was a small table and two reclining deck chairs in which to relax and soak up the sounds of the Australian wilderness. With 12 luxury safari style tents at the property, some also offer full day beds, stand alone bath tubs and a king bed (for the lovers!). As we glanced around, the attention to detail of the space was evident. 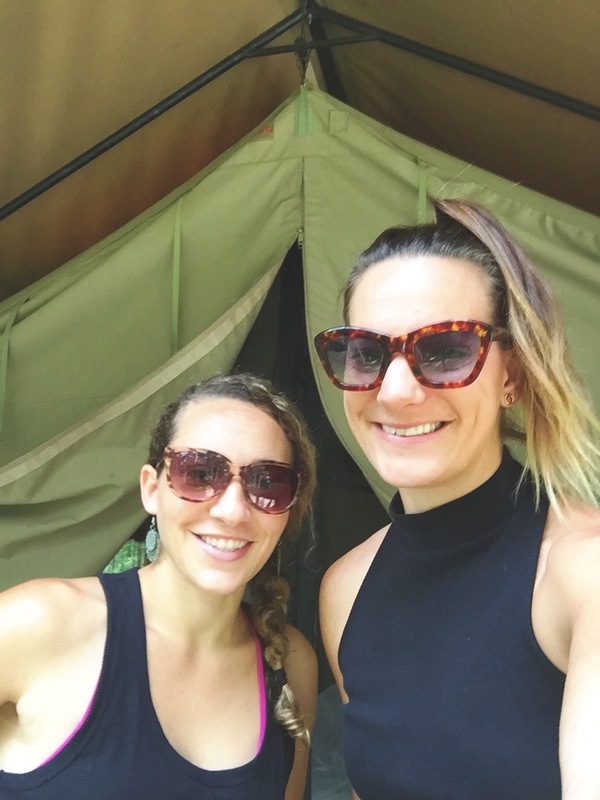 It was functional, eco friendly and oh so very luxe (for camping), and with a wine in hand, we sunk into our deck chairs and sat to appreciate it all before we headed for dinner. The thing that we both immediately noticed was the noise (or the lack there of it). With no power in the tents, there were no TV’s or Radios. Nothing to disturb the soundtrack of the local birds, cicadas and other bush creatures. It was enchanting and something that you certainly take for granted when you’re living in the burbs or in the concrete jungle of the city. As for the food, both of our evenings consisted of a scrumptious 4 course menu, paired with local Australian wines, served at The Gunyah Restaurant. With their philosophy for sustainability, we were acquainted with locally sourced produce and a combination of herb flavours that came from their very own garden. From the spiced quinoa bread, to the slow cooked lamb, pepperberry kangaroo fillet and white chocolate ice cream, each bite was a taste sensation and I was truly disappointed when I’d finished (and almost licked each and every plate clean). Breakfast was just as nourishing and delicious. 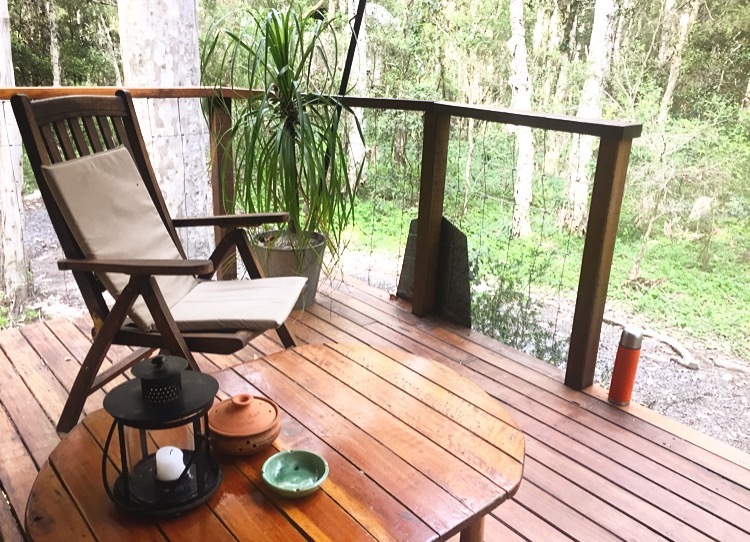 After waking up to the call of the birds and receiving a hot thermos delivery for tea and coffee in our tent, we wandered up to the Gunyah Restaurant and found a table along the sun drenched balcony, perched high among the trees. Home made granola, with nuts, seeds, fruit and honey (straight off the honeycomb) made for the perfect start, along with other continental breakfast favourites. We then had a choice of a camp style hot breakfast or a alternative ‘special’ of the day. Served with espresso coffee or tea, and a selection of the daily newspapers to browse over, it was the perfect way to start each day. The service throughout our stay was attentive, but casual, so whilst you were certainly taken care of, there was nothing pretentious or stuffy about it, which blended into the style of the surrounds perfectly. As for ‘things to do’, Paperbark Camp is the perfect excuse to sleep in, enjoy a leisurely breakfast and just laze the day away on one of their day beds (or by the camp fire in the cooler months), but if you’re a little more adventurous and would like to take advantage of the local surrounds, there are options for you as well. 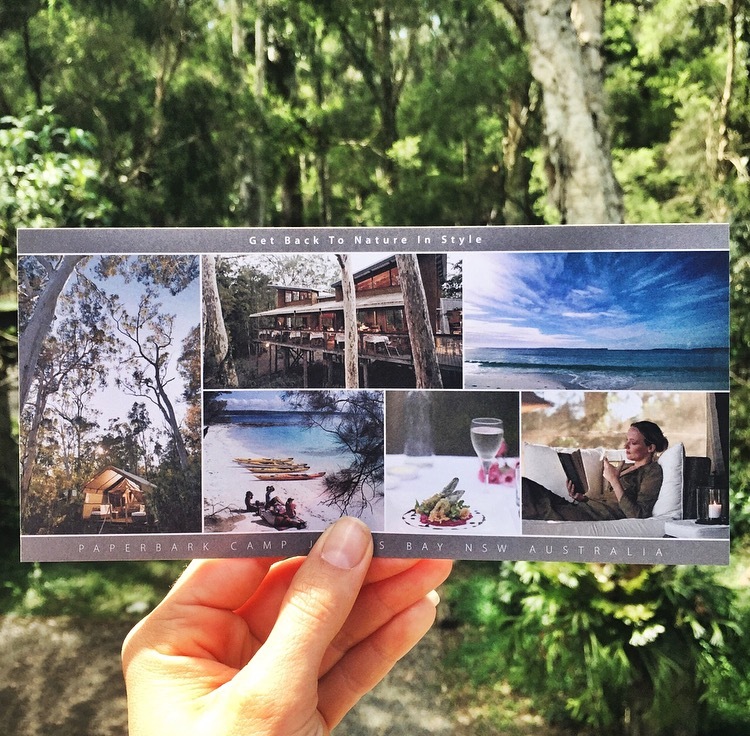 Whilst we chose the former, and included a visit from ‘Pamper Me’ for a 1hr relaxation massage on the privacy of our balcony, others packed a picnic and commandeered push bikes to head along the tree lined paths and into the coastal village of Huskisson. 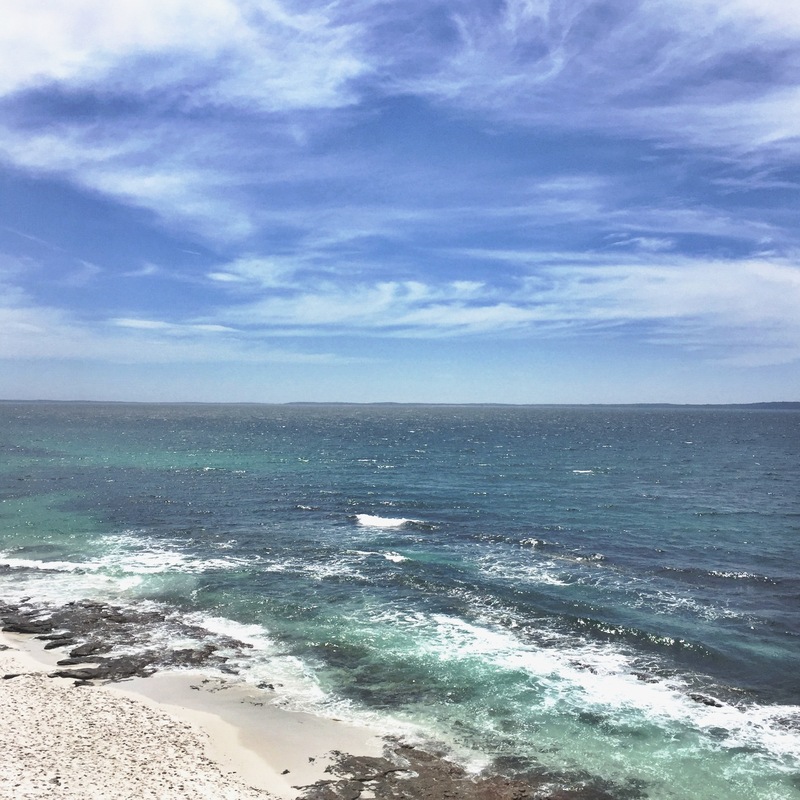 Huskisson has a relaxed vibe and is filled with cosy home ware stores, clothing boutiques, water sports operators and the base for excursions including Whale and Dolphin watching eco tours, as well as yummy cafes to enjoy. Other guests took advantage of the camps kayaks and paddle boards, to paddle along tranquil Currambene Creek, for more water based exploration of the area. Close to Paperbark Camp you’ll also find some of the NSW South Coasts most picturesque beaches, including Hyams Beach, which is renowned for having the whitest sand in the world (as recognised by the Guinness Book of Records). All in all you can make the most of your venture down south and truly envelop yourself into the wonders of Paperbark Camp’s serenity, or use it as a base to explore the region, and return to camp at the end of each day for delicious food, a steaming hot outdoor shower (or bath) and a deep sleep in the heart of the Australian bush. (Just don’t be frightened by the sounds of the nocturnal animals, that may scratch around or call out at night. It’s all part of the safari like experience). In the end, after just two nights at the camp, it was time to head home. 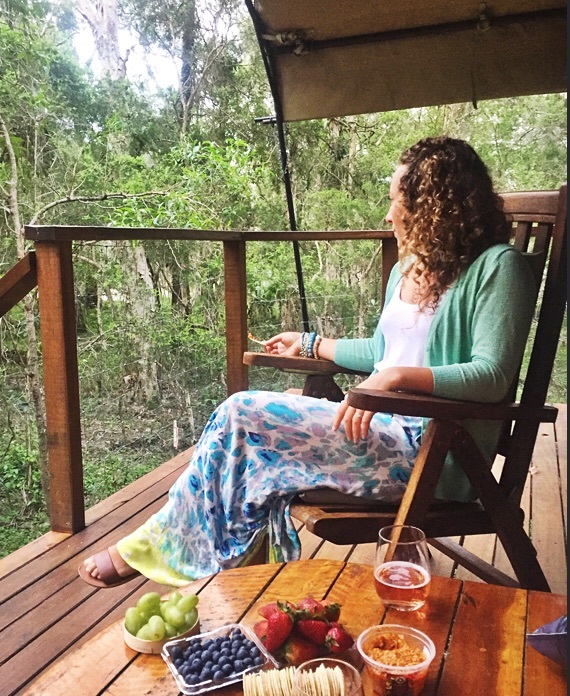 Whilst I felt as though I had only just begun to switch off and unwind, the weekend certainly served it’s purpose as chance for me to spoil my gorgeous friend, with a unique experience that would leave her pampered and rejuvenated, and It was truly a pleasure to be able to experience Paperbark Camp with her. So, as far as luxurious and unique getaway’s go, this is right up there with the best and I wouldn’t hesitate in recommending Paperbark Camp as the perfect glamping destination, and I truly can’t wait to experience it again someday. Below you’ll find links to some of the more basic information about Paperbark Camp, but If you’re looking to visit Paperbark Camp yourself, get in touch with me. I have exclusive contacts and would love to help tailor your visit to ensure that your stay is just as you’ve imagined. I am also able to include some additional amenities just for you that will make it extra special! ← Travel Hit List – 3 Destinations to visit in 2016 and why you should go now! Ok, sounds like I’d better check this out Kate. It looks amazing and it is certainly my idea of camping.